The man behind the Victoria’s Secret angel wings is just one of the innovators trying to create a new generation of space gear. A woman wearing Final Frontier Design’s third-generation suit, the 3G Mark 2. The days of getting dressed up to fly are gone. 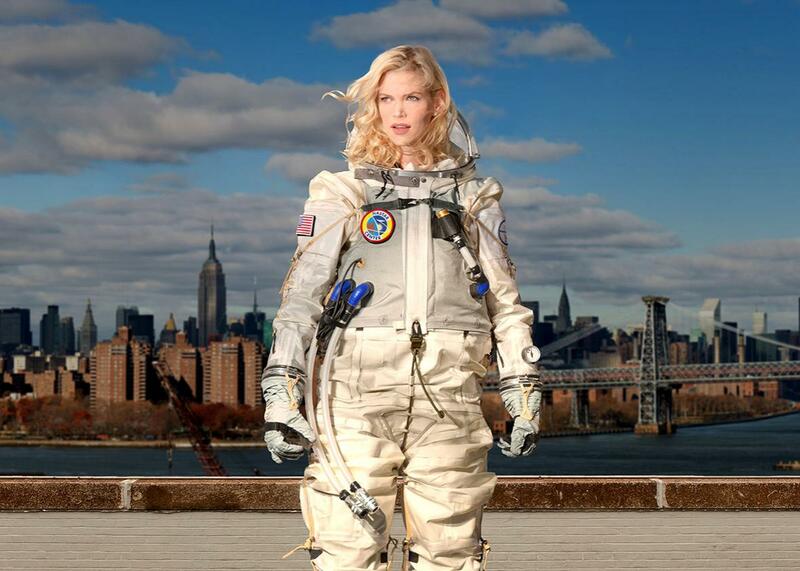 But the days of getting dressed up for space travel—well, they’re on their way. When you think of an astronaut spacewalking, you probably envision the iconic, white spacesuit of Apollo fame. These multimillion-dollar Extravehicular Mobility Units, in NASA parlance, have undergone a number of subtle improvements since the ’60s, but the general Michelin Man aesthetic has endured. This is largely because those designing the suit adhere to the adage “if it ain’t broke, don’t fix it,” which happens to be especially useful advice when you are manufacturing one of the most complex life-support systems in existence. Yet with the vanguard of the commercial space race, this suit-as–life support paradigm is changing in favor of suits that not only keep astronauts alive, but make them look good while they keep on living. When Elon Musk initially contracted Orbital Outfitters, a company founded by a Hollywood prop artist, to design a new suit for future SpaceX astronauts, he specified that the suits must look “badass.” As Musk’s ultimatum demonstrates, the commercial nature of the new space race means that the spacesuit of tomorrow must do more than merely keep its occupant alive—it must also sell a product. The functional requirements and design challenges of a suit largely depend on whether it is an Extravehicular Activity (EVA) suit used for spacewalks or Intravehicular Activity (IVA) suit, which is worn for launch, entry, and abort. An EVA suit must be capable of protecting its occupant from radiation, temperatures varying from 250 F to 250 below zero F, and ebullism, the formation of air bubbles in the body’s fluids in low-pressure environments. On the other hand, IVAs are essentially contingency plans in the event that something goes wrong on board the spacecraft, such as a loss of pressure. They are full-body equivalents of oxygen masks on a plane, designed to allow astronauts to survive long enough to reach safety. (Crossover suits–which function as both EVA and IVA suits–do exist and were used on the Apollo, Gemini, and Skylab missions, although separate suits for EVA and IVA have been standard practice since the 1980s.) As you might expect, the cost of these suits is astronomical: The price hovers around $12 million for EVA suits and $180,000 for IVAs. Perhaps nobody understands the intersection of aesthetics, function, and price better than Ted Southern, the co-founder of Final Frontier Design, a Brooklyn, New York–based company whose mission is to design and manufacture the next generation of space-safety garments for NASA and commercial outfits. Southern and FFD chief engineer and designer Nikolay Moiseev set off on their quest to build a better (and sexier) spacesuit when they took second place in NASA’s 2009 Astronaut Glove Challenge. The glove is arguably the most complicated aspect of a spacesuit due to all the joints and negative space, which become especially tricky variables when you’re trying to maintain a certain average pressure over a given space. Their close-fitting pressurized gloves allowed for a range of movement and tactility that marked a significant improvement over NASA’s current models. In August, in fact, NASA awarded the company its first fixed-price contract for the delivery of a functioning mechanical counter-pressure glove by next summer. 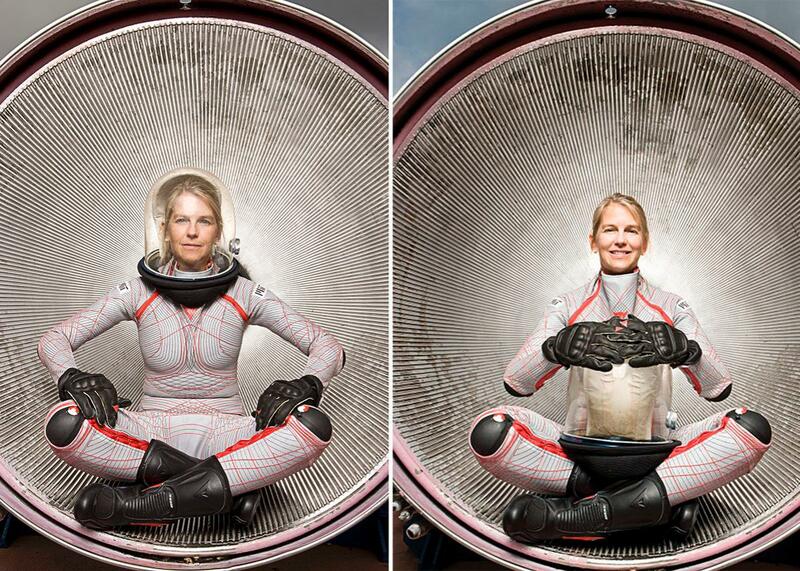 The duo hopes to design a suit that qualifies for orbital spaceflight with NASA. They hope to land a contract by providing a suit that is more lightweight, affordable, and comfortable than NASA’s current model, which includes components whose patents date back to the ’50s. Their goal is to create a suit that would cost about $80,000, which is $100,000 less than today’s IVA suit. While Southern and Moiseev have made components for EVA suits, for now they plan to stick mostly to IVA systems. “At this point, our only market for an EVA suit is NASA. None of these [new space] companies are going to be going EVA for a while,” said Southern. The duo is optimistic that the work they’re doing on pressure garments could provide valuable insight into EVA design in the future. That plan assumes, however, that gas-pressurized suits will remain the standard for tomorrow’s astronauts—a prospect that is cast in doubt in light of the advances made in the area of mechanical counter-pressure suits. The BioSuit, invented by Dava Newman of MIT, designed by Guillermo Trotti, and fabricated by Dainese. At the helm of these advances in mechanical counter-pressure is Dava Newman, the deputy administrator of NASA and a professor at the Massachusetts Institute of Technology. Last year she unveiled the BioSuit, an EVA which essentially shrink-wraps astronauts to apply the requisite amount of pressure (one-third of an atmosphere) to stave off ebullism. Although the first mechanical counter-pressure suits were prototyped by NASA in the early 1970s, they were ultimately rejected for further research due to the inadequacy of materials to make them a viable alternative to gas-pressurized suits. The BioSuit, in addition to Final Frontier’s latest glove contract, suggests that these times have past. By allowing astronauts to don and doff the BioSuit using a fraction of the effort required for their bulky, gas-pressurized counterparts, astronauts will be able to conserve their energy. That will become a crucial factor on long-duration space flights to places like Mars, which will require more spacewalks than humans have performed in total to date. Each BioSuit will be tailor-made to its wearer thanks to full-body 3-D scans. Perhaps the most noticeable revolution in spacesuit aesthetics is the attention to human form—the spacesuits of the future will become increasingly tailored to the individual. One of the many upsides of this, according to Newman, is that it will be possible to differentiate between male and female astronauts at a glance. There is also an increasing attention directed to aspects of the suit that had formerly been mere functional considerations, such as its color. The BioSuit is crisscrossed with red and black stitching against a white background, creating something of a topographic map of the astronaut’s body. Newman and her team worked closely with students from the Rhode Island School of Design to create a suit that is both futuristic and chief. When it comes to designing the high fashion of our extraterrestrial future, there is no need to sacrifice style for safety. It may be a while before there’s a Martian fashion week. But hopefully it will be even longer before we start heading to space in sweats.